The name France means 'Land of the Franks.' The Franks were a Germanic tribe who lived in Northern Europe after the fall of the Roman Empire. Although only the size of Texas, France has seven mountain ranges and five major river systems. It is the largest nation in Western Europe, with countries like Spain, Italy, Switzerland, Germany, Belgium, Luxembourg, Andorra and Monaco sharing its boundary. France is home to 29 UNESCO World Heritage Sites like the Mont St. Michel Abbey, Versailles Palace, and the Chartres Cathedral. It has nearly 3000 miles of seashore, with three major water bodies: the Atlantic Ocean, Mediterranean Sea, and the English Channel. It is also referred to as L'Hexagone, which means the hexagon, due to the geometrical shape of the country. The flag of France is blue, white, red. 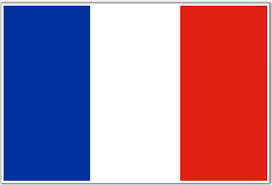 It is known as Le Drapeau Tricolore (or the three-coloured flag) because of its three colours. It has existed since 1794. The marriage of Eleanor of Aquitaine with the future king of England, Henry II led to British rule in France for about 300 years. French wine is immensely popular all over the world. The country is one of the largest wine producing nations in the world. There are 17 distinct wine producing regions like Bordeaux, Burgundy, Champagne, Loire and Provence that continue with the tradition of wine making in France. An amusing fact about France is that while beer is considered a luxury drink saved for special occasions, wine is free with most meals. France is also home to the only Disneyland in Europe, located near Paris. An underground rail tunnel, known as the Channel Tunnel, joins England and France. It runs beneath the English Channel, connecting Folkestone, Kent in England and Coquelles, near Calais in France. The Tour de France, the most famous bicycle race in the world is an annual bicycle race of France, in which cyclists cover over 2100 miles in 23 days. The concept of jean clothing was born in the Languedoc-Roussillon city of Nîmes, France, from where it was imported by Levi Strauss to California to make tough clothes for gold diggers. The Statue of Liberty, one of the most widely recognized structures of US, was made in France. It was then gifted to the US in 1886 to celebrate its centennial. April Fool's Day is believed to have originated in France, in 1564, when the country started following the Gregorian Calendar. Those that did not know about the switch in the calendars, were mocked on this day as they continued to believe that 1st April was the first day of the French new year. France is the home of the TGV - Train à Grande Vitesse, French for high speed train. A TGV test train set the record of being the fastest train when it reached a speed of 357 mph on April 3, 2007. France is also home to the Louvre, one of the largest art museums in the world. The French national anthem is called La Marseillaise. It was composed by Claude Joseph Rouget de Lisle in 1792. An important emblem of France is the cockerel (le coq). It is used on the sportswear of French national teams. It is a courageous animal, willing to fight. The French symbol of freedom is the woman known as Marianne. Her image is seen on coins, stamps and paintings. She wears a 'cap of liberty' on her head. The country of France is divided into twenty-two regions. One of the most important dates in France is the 14 July. This is known as Bastille Day and it is a national holiday. In France it is called La Fête Nationale. The guillotine was the method of execution developed during the French Revolution. It was invented with the help of surgeon, Dr. Guillotin. In Paris, it was used regularly in La Place de la Concorde. The guillotine remained the official method of execution in France until 1981 when the death penalty was abolished. The last time it was used was as recently as 1977. The shrine of Saint-Denis is in the Basilica of Saint-Denis, Paris. Most of the kings and queens of France are laid to rest in this cathedral. Tower (La Tour Eiffel) was designed by architect Stephen Sauvestre and built by the construction company of Gustave Eiffel between 1887 and The Eiffel 1889. La Tour Eiffel is cleaned all year round by a team of cleaners. Each year they consume 4 tons of paper wipes, 10,000 doses of detergent, 400 litres of metal cleaner and 25,000 rubbish bags. The re-painting of La Tour Eiffel begins every seven years. The current painting job commenced in March 2009 and is expected to last for about 18 months. It will require around 60 tons of paint in three different shades of brown. The French people call the English people les rosbifs, meaning - the roast beefs!In 1624, King Louis XIII built a hunting lodge in the village of Versailles, outside Paris. This building was enlarged by the next king - Louis XIV - who turned it into the magnificent palace we see today. In French, this palace is called Le Château de Versailles. In France, they eat snails (les escargots), frogs' legs (les cuisses de grenouille) and horsemeat (la viande de cheval). bread is la baguette (little stick). It is a loaf 5 or 6 cm. wide and up to a metre in length. If it is a thinner version, it is called une ficelle (a string) and if it is wider it is called une flûte. France has won the Football World Cup only once - in 1998. The French football team is nicknamed Les Bleus (The Blues). Denim is a fabric that came originally from the French town of Nîmes (de Nîmes). The "cancan" is a very energetic and acrobatic dance that first appeared in Parisian ballrooms in the 1830s. The tradition of the white wedding dress began in France. Anne of Brittany is believed to be the first bride to choose a white gown when she married Louis XII in 1499. Every May, there is a famous film festival in the southern seaside town of Cannes. It began in 1939. The most famous mountain in France is Mont Blanc, meaning White Mountain. It is also known as La Dame Blanche, meaning 'The White Lady.' It has a summit 4,800 metres high and is the highest mountain of the Alps. In the south of France, near to Cannes, there is a town called Grasse and it is very famous for growing flowers. The tallest bridge in the world is in the south of France. It is called Le Viaduc de Millau and it was opened in December, 2004.